Most women experiencing menopause are all too familiar with the hormonal upsets it creates. In many cases, the unfortunate phenomenon can manifest itself as a tingling in the extremities or other uncomfortable symptoms. Luckily, obtaining some peace of mind is just around the corner. Continue reading to learn about causes and treatment of tingling in hands and feet at night to finally get some evening relief. While individual cases may vary, the following are among the most probable causes of numbness and tingling in hands and feet at night. Numbness of hands and feet while sleeping often occur as a result of increased pressure exertion on the peripheral nerves from enlarged blood vessels. This, in turn, creates poor circulation, cutting off the supply of blood to the extremities. Having built up throughout much of the day, the problem seems to be particularly troublesome at night when sufferers are less likely to be mobile. Carpal tunnel - which includes the pain, tingling, swelling, or loss of sensation in the wrists and hands - can be of particular concern for menopausal women. In fact, women between the ages of 45 and 54 have a higher risk for developing the syndrome, whose symptoms are exacerbated by lack of movement during the night. In postmenopausal women, the structure of the wrist is enlarged, and can often place additional stress on nerve endings, accounting for at least some of the nighttime tingling and numbness felt in the hands. Tingling and numbness of the hands and feet are usually indicative of low vitamin B12 levels in the body. As people age, the body loses some of its natural ability to absorb these vitamins from food sources, and many women will, in fact, develop minor to acute forms of anemia because of it. 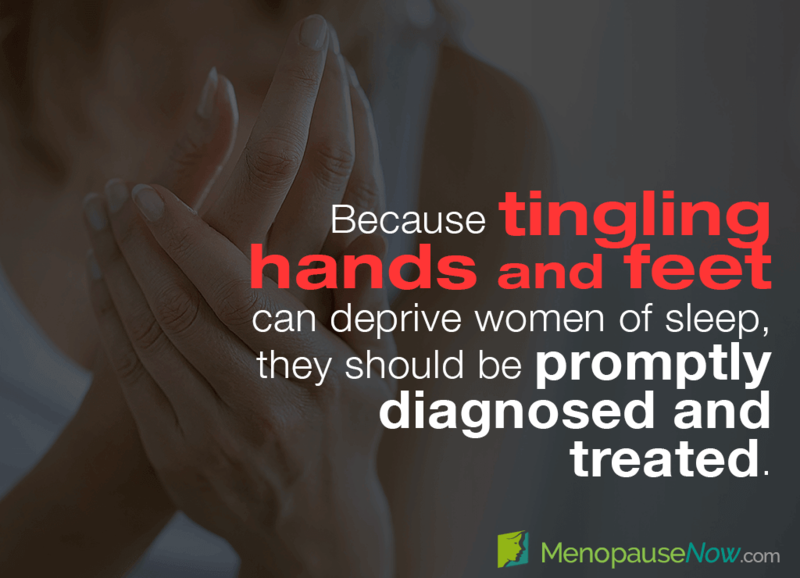 Since tingling extremities is seen more often in menopausal women than women of other ages, it is thought that fluctuations in hormone levels during this transition may play a role. The fact that estrogen influences the nervous system also supports this idea. Neck and lower back injuries, such as from poor posture, account for many of the other abnormal sensations felt all along the arms and down the legs, causing numbness in hands and feet during sleep. The best thing to do when numbness and tingling of the hands and feet strikes is to suspend all activities related to the attack. If you wake in the middle of the night, do not let the problem fester. Instead, immediately correct your posture so as not to lie more heavily on one side than the other. If pain and discomfort persist, get up and try moving around. Stretch lightly and gently massage the affected areas, returning to bed only after having eased the symptoms and regained a desire for sleep. Besides adequate rest, a multitude of treatment options can help you to manage the pins and needles in hands and feet at night. While pain and swelling can often be effectively reduced through the use of prescription and over-the-counter drugs, lifestyle changes paired with alternative medicine are less invasive forms of treatment that many menopausal women wish to pursue first. These provide a preliminary framework for managing burning tingling hands and feet at night. Click on the following link for more info on natural and effective treatments for tingling extremities. One of the lesser-known symptoms of menopause is tingling and numb legs. Although rarely a serious problem, it can be an annoying and frustrating symptom.